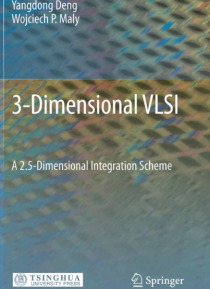 "e;3-Dimensional VLSI: A 2.5-Dimensional Integration Scheme"e;elaborates the concept and importance of 3-Dimensional (3-D) VLSI. The authors have developed a new 3-D IC integration paradigm, so-called 2.5-D integration, to address many problems that are hard to resolve using traditional non-monolithic integration schemes. The book also introduces major 3-D VLSI design issues that need to b… e solved by IC designers and Electronic Design Automation (EDA) developers. By treating 3-D integration in an integrated framework, the book provides important insights for semiconductor process engineers, IC designers, and those working in EDA R&D.Dr. Yangdong Deng is an associate professor at the Institute of Microelectronics, Tsinghua University, China. Dr. Wojciech P. Maly is the U. A. and Helen Whitaker Professor at the Department of Electrical and Computer Engineering, Carnegie Mellon University, USA.